I met Rex at a party in 1983. He arrived brandishing a large Bowie knife, seized my arm and sliced the blade across it, leaving a large trail of blood. The knife didn’t feel sharp and the blood didn’t look real but I was thrilled by its ingenuity. The knife handle was a thick rubber tube which when squeezed, forced the ‘blood’ out of a row of tiny holes along the edge of the blade. He had made it as a prop for a TV drama. I saw him for the last time in autumn 2017 in a care home, virtually unable to speak and tearful, his mind ravaged by dementia. I would never have imagined that it could happen to someone so amazingly energetic like him. When we first met he had already had two glamorous careers. As a teenager he was a speedway bike champion, sponsored by Riley’s Crisps. He had a scrapbook of old bike magazines, several with him on the front cover. From working with his friend Dave Bickers in the early days of 'Bickers Action', he got into special effects and props for Anglia Television amongst other companies. One prop I remember vividly was a severed hand, complete with bone and arteries protruding from the wrist. This used to sit on his bandsaw table, sometimes with with fresh ‘blood’ when he wanted to impress visitors. This career came to an abrupt end when he was banned by a film union (special effect work was a closed shop at the time). For a while he then repaired washing machines, but was itching to do something more interesting. The first job we did together was a wind powered clock for Liverpool garden festival in 1984. At his workshop I was amazed at the way he worked. He attacked everything with reckless speed and quite often threw half finished things away to start again, cursing and blaming God for the setback. Despite this progress was amazingly fast. The clock escapement, using an old car wiper motor and flywheel ring gear, took him only a couple of days to make. I struggled to keep up, particularly because his workshop was always chaotic and impossible to a clear a surface to work on. Having spent a couple of hours polishing a bit of perspex I didn’t know where to put it so it ended up on the concrete floor. I then promptly slipped on it - scratching it terminally. Rex enjoyed moments like this enormously. Despite the problems, I learnt an enormous amount just watching him. He seemed to do everything in unconventional ways. When his guillotine got blunt, he didn’t send the blade away to be sharpened or even remove it from the machine, he just ran his angle grinder along the edge. Watching him use the lathe was particularly memorable. He always ran the spindle too fast and cut too deep, things I would never dare do myself, but it gave me a feel for the limits of what was possible. When things were going OK he always delivered a constant stream of bad jokes. The days were always entertaining, he was so sociable there were always visitors and lots of tea breaks. Then there were the daily trips to Sackers, the local scrapyard. Here we would sift through the latest stuff to arrive at the yard and strip any parts that looked useful. The scrapyard was central to Rex’s life, he could never resist getting ‘useful stuff’ for free. Long before anyone talked about global warming and recycling, Rex just thought the scrapyard was a source of bargains and that companies were fools for throwing the stuff out. Perfectly working machine tools, full sheets of aluminium and stainless steel, hi tech factory automation modules, brand new milling cutters – we never knew what to expect, but there was always something. Rex visited Sackers almost every day for 40 years. To accommodate the treasure he constantly expanded his workshop. Eventually it comprised of his original garage, a 40ft by 30ft extension on the back of the house, a large poly tunnel and several shipping containers. Every inch of space was stuffed full. Once in the care home never to return, his wife Sally decided it was time to clear everything out and invited me over to see if there was anything I wanted. His friend Phil was in charge of the clear out, helped by Terry, Colin and Stephen. I was just expecting to collect a few things and leave them to it, but I got sucked in and joined the team. We worked almost every Tuesday for over three months, rescuing everything we could. Even then there was still so much stuff I lost count of the number of skips we filled. It was a massive job but curiously addictive. We often found objects that triggered memories and constantly swapped stories about Rex. The whole experience was like a protracted wake even though he was still just alive. Many things showed off his skill and ingenuity. One was the rotting remains of a full size animatronic rubber shark that had swum underwater for an advert. At the time I’d been amazed that the windscreen wiper motors worked completely submerged in water. At first they weren’t powerful enough to flex the shark’s body but he realised the water kept the motors so cool that he could run them at 60 volts (5 times their normal 12 volts). This massively increased the motors’ power and the shark then performed perfectly. The only trace of ‘The Secret Life of Machines’ tv series we did together was an old reel to reel tape recorder with a pot of ferric oxide. He enjoyed showing kids how to make sound recordings using sticky tape and rust. He had destroyed the huge Van De Graff generator, the biggest prop we made in his workshop, in a fit of rage, but I remembered the fun we had getting it to work. At first it produced no sparks at all, but when he switched the lights off we could see tiny sparks on everything up to ten meters away. Most of the electronic devices which happened to be switched on in the workshop never worked again. Around the Van De Graff globe itself a faint green corona glow showed where the charge was leaking. It didn’t take long to get rid of the edges and rough patches that were causing the charge to leak and then it worked as it was supposed to, but it was never as exciting as that first attempt. 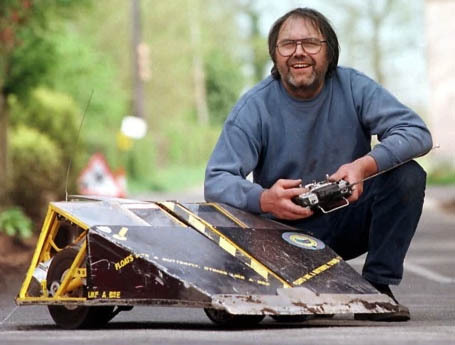 There were his ‘Robot Wars’ robots - wedge shaped with a flipping mechanism to tip over opponents. (I think he invented the wedge, which was copied by many contestants). Also several ‘Brum’ radio controlled cars made for a popular kids TV series. These were so complicated, every detail was radio controlled - doors, headlights, wiper blades, starting handle etc. These didn’t go in the skip, there’s still a market for anything Brum related on Ebay. Rex loved weird stuff, something we shared. He had a gallon can full of mercury that was too heavy to lift. At some point Sackers had got worried by the mercury in their yard and offered it to him. I remember what fun it was to play with – a liquid so heavy is completely counter intuitive. Because its so toxic it can cost a fortune to dispose of but Phil somehow found a company that wanted it and even paid him a few hundred pounds. Rex also had an explosives cupboard. Most of it was gunpowder and fireworks but Phil thought there had been a lump of plastic explosive. I never found it but there were some explosive bolts – the sort that separate the stages of a rocket as it gains height. I have no idea where he could have got them. He also liked to make big bangs by mixing Oxygen and Acetylene in bin bags. He used to say it was harmless because the bags didn’t confine the gases. Then one went off while he was holding it. He didn’t get badly burned so he was sort of right, but I don’t think he ever tried it again. Except on a smaller scale, like the day I bought an explosive gas meter at a car boot sale (no ordinary boot sale but the Dunstable Downs radio rally sale – at the time a mecca for all things weird and scientific). Rex decided to test my meter by filling the rubber bulb with oxygen, adding tiny amounts of acetylene to get a reading. The dial stayed firmly in the green ‘safe’ area so we kept adding more. Eventually the rubber bulb exploded – maybe that’s how it was supposed to work. There were a lot of chemicals and stuff for spray painting. Its not easy to spray a car perfectly, but Rex was very, very good at it. In fact he was good at anything related to cars and engines. Soon after I first met him he bought a crash damaged Toyota Celica sports car to convert into a pickup truck. He made a beautiful job of it but the DVLA wouldn’t licence it. He eventually wrote to his MP and astonishingly this did the trick. What I didn’t know at the time was that when he eventually went into the DVLA office to collect his tax disc, he demanded to see the manager. After being stalled for hours the man eventually appeared. Rex asked him if he was a civil servant and then told him he should in future try to be more civil and a better servant. Rex could never cope with bureaucracy and because he was so larger than life, kept confronting it. Terry and Colin used to work for BT at its Martlesham research centre so are not bothered by it. Phil, Stephen and I are more like Rex, but better at keeping under the radar. The clearout also reminded us of stories Rex used to tell us. One I particularly liked was about his drive home from Scunthorpe after a speedway event. The car broke down in the middle of the night and he traced the fault to the petrol pump, which was unrepairable. Instead of waiting until the morning he taped a plastic petrol can on the roof. Amazingly gravity was then enough to feed the petrol straight to the carburettor. Although reminiscing and trying to do the best with his hoard were our main topics of conversation, our amazement at the sheer amount of expensive high tech stuff that he’d rescued from the scrapyard kept growing and growing. I’d never been quite so aware of the wastefulness of the modern world. I suspect that David Dodds, who owns Sackers, was pleased that Rex was rescuing the cream of the stuff deposited in his yard. Towards the end of our mammoth clearance I realised we were dissecting the demise of British industry. In about 1980, when Rex started collecting, Britain was still a major manufacturer with highly respected products, even if our prices had become less competitive. The treasures ending up in the Sackers were the result of successive local companies going bust. So evident from Rex’s collection was that the companies had invested in the latest equipment to try and keep up, but it had obviously been near impossible for them to survive. The decline is still not completely over because there are still some small marginally profitable companies, trading until their owner retires. I tried to find good homes for the motors and pneumatic equipment I couldn’t bear to put in the skip, but it wasn’t easy. Not only is there less industry but also fewer people who have the knowledge or workshops to use stuff like this. I absorbed quite a lot into my own stores. At the time it felt crazy expanding my stores as I am already 67, so it triggered a mass sort out of my own stuff. Since doing this, I find I use something of his almost every day. Quite often I curse him – he rarely tested his finds and many things don’t work. But mostly its nice to have these regular reminders. I often tell people I learnt more from Rex than from my entire formal education. Of course its actually more complicated. I got a good grounding in maths and physics at school, then went to Cambridge and left confident to pursue whatever interested me (I’ve felt embarrassed by this enormous sense of privilege ever since). But more of the knowledge I use in my workshop comes from Rex than from Cambridge. His own background was very different. His father was a local thatcher and Rex was apprenticed to a local electrician called Bill Bunn. Bill recognised his talents and taught him things like electric motor theory, a subject I still don’t fully understand. Rex used to enjoy poking fun at me for making mistakes with my posh education. Although well hidden, I think he lacked confidence in some way and compensated by regularly showing off. So it was just perfect that at the height of his career, the university of East Anglia awarded him an honorary doctorate. He loved dressing up in the robes and going to all the events. If ever anybody deserved one it was Rex. I hope I will forget his final distressing years and remember him as the true genius that he was - Dr Garrod.